Designed for modern lifestyle. 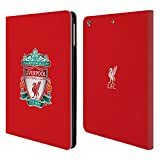 This Liverpool Football Club soft leather wallet style iPad case has been handmade to be stylish and functional. This entry was posted in Liverpool and tagged Apple, Book, Case, Cover, Crest, iPad, Leather, Liverpool, Official, Wallet by Footy Star. Bookmark the permalink.